my bare cupboard: Tonkotsu ramen with chashu ( Japanese braised pork belly ) and ajitsuke tamago ( marinated soft-boiled egg ) "
The temperature's getting hotter lately , except for the incessant rain these past few days , I'm afraid summer is about to barge her way in , earlier than usual . Since I don't really like to slurp a piping hot noodles when it's 30°C outside , I keep reminding myself to make the Japanized version of Chinese noodle soup while the weather is still tolerable . 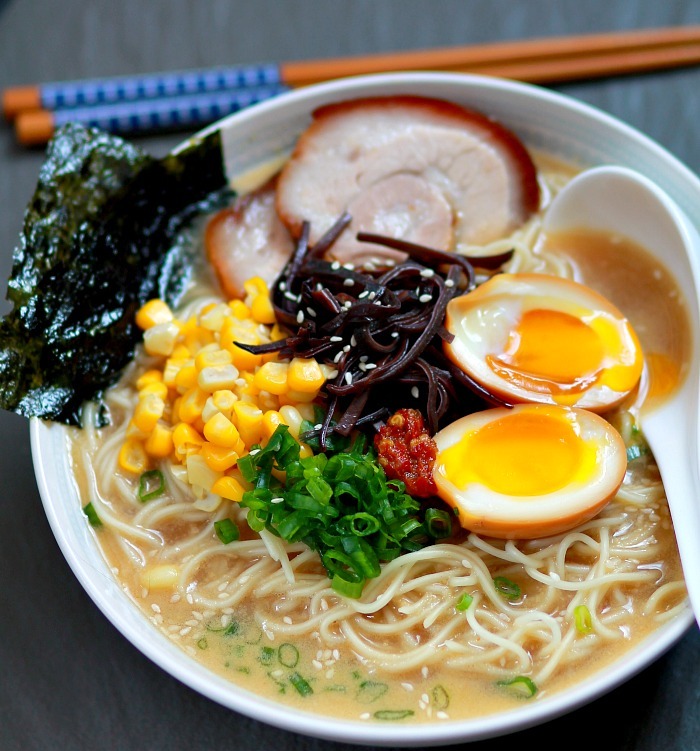 Ramen is a Japanese noodle soup dish and is popular worldwide . A typical bowl consist of noodles with broth , toppings such as braised pork , soft-boiled egg , nori and chopped spring onions are added . There are several variation of ramen throughout Japan , tonkotsu ( pork bone broth ) and miso-based broth seems to be quiet popular even outside the country . Making tonkotsu broth from scratch is quiet easy , all you need is TIME and patience . I boiled mine for about 8 hours and thinking how much would be our electric bill at the end of this month lol Let's not forget the 3 hours of braising the chashu hee hee ! So , it's well worth the effort ?! 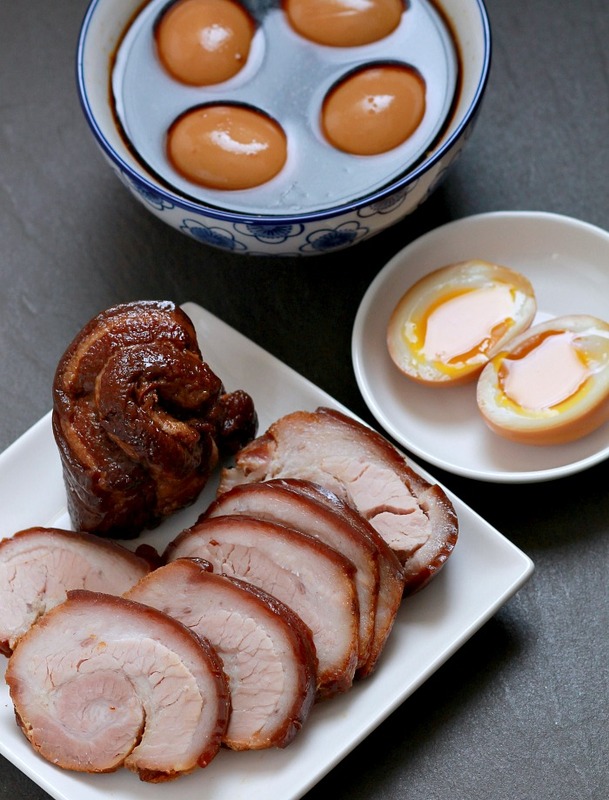 You can get away by making those easy to make broth that doesn't need several hours of boiling but making the chashu and the ajitsuke tamago is well worth it . Will post the recipe of them next time because I'm not too happy with the look of my chashu tsk tsk ! Stay tuned ! * Heat tonkotsu base in a small saucepan . In a small bowl , whisk tahini , chashu liquid , grated garlic , salt , mirin and ground pepper . Add this to the broth and whisk to combine . Taste and adjust salt as needed . Bring to a simmer . Refresh noodles under warm running water , drain briefly then divide into 2 bowls . Pour in the broth , top with chashu , boiled egg and whatever else you want to add . Sprinkle with toasted sesame seeds and serve immediately . ** In a small mixing bowl , soak 10 grams of wood ear mushroom until softens . Throw water and wash mushroom , cutting out hard bits . Boil water , blanch mushroom for 10 seconds , rinse and pat dry with paper towel . Slice thinly , transfer into a small bowl then add in few drops of mirin , cooking sake and sesame oil , mix well . * Place trotters and chicken carcass in a large stockpot , cover with cold water . Let water boil for 5 minutes then dump everything into the sink . Wash trotter and chicken carcass thoroughly then drain , set aside . * In a large pan or a wok , add some oil when oil is hot , throw in the onion , garlic and ginger , cook for 5 minutes . Return back the trotter , chicken carcass , the fried onion mixture , leeks and the mushrooms into stockpot and cover with cold water . Let boil , skimming off scums that appears on top , boil over high heat for 10 minutes then turn down heat to low , simmer for about 8 hours , stirring from time to time , add more water to cover the bones . * Strain stock into a large bowl , discard solids and skim off excess fat . Slurp!!! This looks seriously delicious, as good as those in our favorite ramen places :) Sure sounds like a lot of effort though, well done Anne! You have me at those marinated soft boiled eggs! The noodle soup looks mouthwatering, Anne. Anne, I just had my dinner a while ago but I don't mind to have another bowl of your delicious tonkotsu ramen. Simply delicious! I can't even tell you how much I would ike to dive into that bowl of Chinese Noodle Soup! What an interesting combination of ingredients and flavors. I'm sure it would be well worth the electricity and the time. I'm not sure about how you bring it all together though. 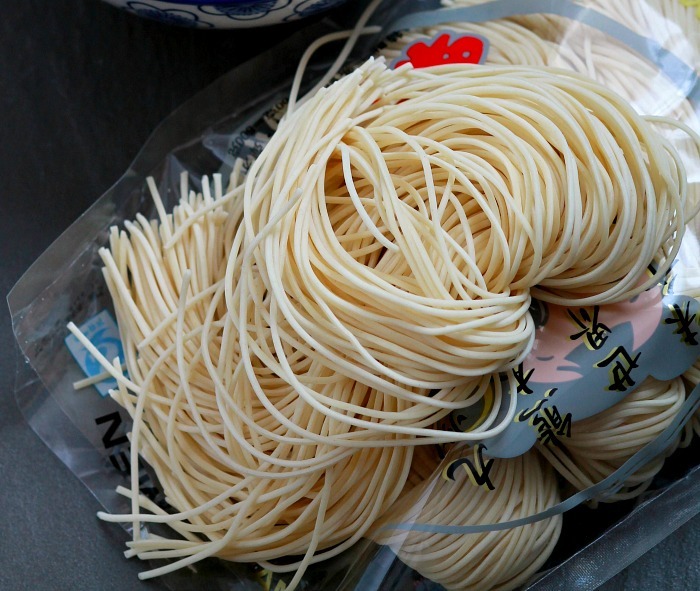 Do you prepare the Tonkotsu ramen broth and then add the Tonkotsu ramen? Chances are I won't be preparing this dish any time soon, although I wish I were. I guess I'll just have to wait until you come for a visit so you can show me in person, lol...Thank you SO much for sharing, Anne. I would so love to try this!!! This looks pretty good to me-white balance or not! Oh, I am salivating looking at your bowl of ramen!! Was the tonkotsu stock very rich and thick, like it can glue your lips? I don't really appreciate too thick and rich stock. What a gorgeous dish, Anne! I'd eat this no matter the weather!!! 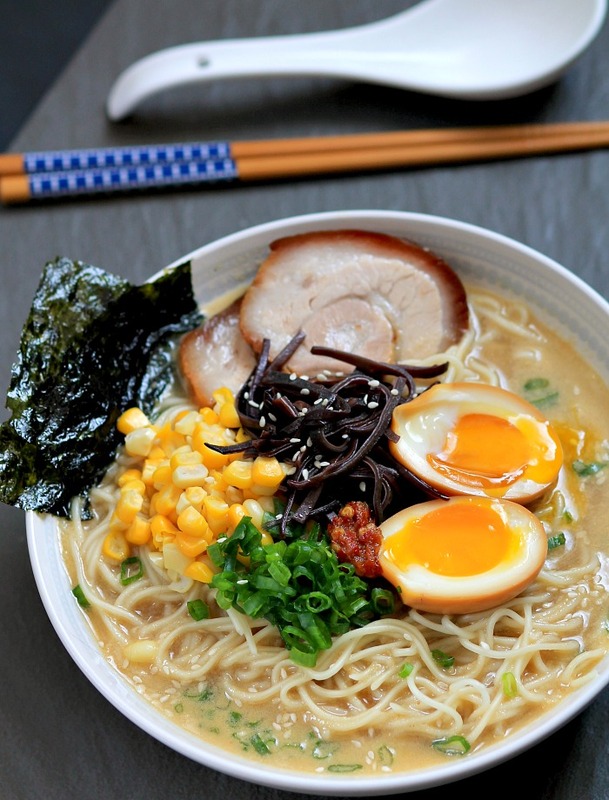 I love tonkotsu ramen and we do have a few good Japanese restaurant serving this but they are pretty pricey! I guess with the amount of work going into making them, they have to be huh! Waiting for your eggs recipe! Hi Anne, I LOVE LOVE ramen, but there's so much work to make it!! no wonder they always cost an arm and a leg in the shops. Yours look seriously so good. WOW, your ramen picture looks stunning! It looks exactly like the authentic Ramen I had in Japan. Pinned to save the recipe for later use. Those eggs look perfect too! wow, damn delicious, the photograph is way beyond stunnig too!!! maybe i missed them from the ingredient list... what are those dark thick spaghetti on top? I love them but have not idea what they are! Uncle Boon's Thai roast chicken , sort of ? !